Today was my moms birthday. It was also my friend Yianni's birthday. I'm notorious for throwing parties, especially birthday parties. Life deserves to be celebrated. So what does the only child of a single woman do? Throws a party and invites my friends. Including Yianni, because the woman who doesn't get BMX, I mean GET IT, should definitely be with a crazy group of BMXers. Yes, definitely. Tonight when I said goodbye and kissed her off she thanked me as she always does but she added, "you have such a great group of friends." That simple statement from my mother spoke volumes to me. She does get it. In fact, I realized at that moment, the last three parties I've held she's attended. She still doesn't come to the track, but she's coming to parties. This is what BMX is about for our family: celebrating life. Yes, winning races is what racing BMX is about, but to stay long term, truly engross yourself in the culture, means to make BMX part of your life. It's just hard not to. My point is, tonight, BMX bonded my blood family to my friend family and it was awesome. Also, anytime you have two kinds of birthday cake, you're doing good. 2014 Summer tour DVD preview. from WestSideBmx TV on Vimeo. The tour was once again a great experience and if you read Allisons blog then you got a little insight.I have over 5 hours of footage to start sorting thru for this years DVD and this video is just a preview.Give it a watch and stay tuned for more. I've started to write this blog three times and I've come to the conclusion that some things just can't be put into words. I thought writing about the Love Series was difficult but that doesn't hold a candle to the experience we had over the past week. For those of you not completely up to speed, our family hosted the 2014 Westside BMX Tour as the crew rolled in from the Vegas national. That in itself was a great time... If I had a quarter for every time I heard "pace yourself", well let's just say I wouldn't have had a bar bill. The warnings came on the eve of the Tour, and just as everyone expected and anticipated, the week following proved to be the real fun. Vegas just warmed us up. So, as we got home last Monday, we knew there was fun to be had. Basically, we had just enough time to unload, clean up and we were planning the next adventure. What followed was probably the best week of my kids' lives and a testament to what the Bmx community can do for kids and parents. What I didn't expect though, was to miss all these crazy people in my home. To walk around the day after bored and lonely and well, cranky. Especially Corben. The Corbster made new daddies again out of a few good men and he had enough love and attention to make him notice it was gone. It's amazing how fast you adapt to having 15 to 20 people in your house and the excitement that comes with knowing each morning we had the day to do whatever we wanted. And that donuts were totally acceptable. First on the agenda: a day of relaxation to regroup. We called this the Super Slide day. I mean SUPER SLIDE. This wasn't just any slide, oh no, it was the 100 foot vision of James Traylor. When we learned the Tour had lost its Tahoe cabin due to unforeseen pipes breaking, it was dismal. Tour was looking to be cancelled. I said to Greg, "I wish we could tell them to come here." His response: "Tell Jess they should come stay here." It was an easy call to make. I mentioned it to Cuzzo and I think from that moment on James' slide building wheels began churning. We had everything but plans. "I got $100 to make this the best slide ever!" With that said James, Bix and Shawn were out. Well, that 10x100 foot slide was the best and the Corbster got a new pool out of it too. Yianni took some time to recover but his 'always willing to try it once' attitude definitely helped tweak the slides early issues and make it better. I think the big guys had as much fun as the little ones. Until we needed supplies. All I'm gonna say is two bottles of baby oil and two bottles of liquid soap were sacrificed. And maybe a hip bone or two. But collateral damage is really, truly the only sign of serious fun had. Slip and Scar a success! But, reality was setting in that slide fun had to end because we had a long day ahead Wednesday: Woodward. Woodward was just plain awesome. The people were awesome. The facility was awesome. And let's face it, NorCal Sierras are just plain awesome. I know all of us there will bring home our own memories. For us parents I know those included watching our kids showcase not just their bike skills but their personalities. I watched BMX racing kids become champions of dirt jumps over and over. For me, I keep replaying Nick conferring with his buddies on the logistics of hitting jumps and each new obstacle conquered started the same way for each boy, as a fully supported Tour rider. "Dude, you got this! YOU'VE TOTALLY GOT THIS!" There was no kid checking with adults, they were checking with each other. Sure some of these boys have been riding together for 5+ years. Nick, Donovan and Zack for seven together. They know each other's skills so well that pushing Josh to hit six foot jumps on his 16" pit bike was worth very second of seeing him rip it up. Did he crash? Umm, yes. They all did. They all got up, checked on each other and hit that sh*t again. Over and over and over until they were ALL happy with each other's passes. It's awesome to see the confidence building in each one. How they totally and completely supported each other. Sharky earned his stripes Friday when he was the first to hit the third big jump at our secret spot. Nick followed immediately. Both clipped in on race bikes. Totally. Freaking. Rad. And I don't wanna hear how my kid should be on flats, yada yada... I know that, you know that, but he wasn't comfortable on them and yes, he learned a quick lesson why flats are needed when he almost lost his battle to a blackberry bush and the road four feet below. Nice no-handed, front-wheelie for ten feet while clipped in trick. No, not nice trick. A nice save. Watch the video, I'm telling you it was insane. Again, nice save Shawn. Thank you for not letting my kid end up in ER. Lesson learned. So, yeah, the kids had farting contests, jumped stuff all over, ate five dozen homemade cookies in one night (thanks Zip and Bix!) and finished each day piled together in bags and air beds. For an entire week, we lived together, rolled four cars deep everywhere. Even to feed the cat. We shopped together, played together, crashed together, cried together, cleaned wounds together and obtained enough inside jokes based off personal information to last us til next year's Tour. It was an experience I wouldn't trade for anything and one I can't wait to do again. Off to Vegas and start the 2014 tour. We are getting ready to leave for Vegas and our 2014 tour. Last year we hit SoCal and this year it's NorCal. Be sure to follow us on all social medias and check back here for updates. 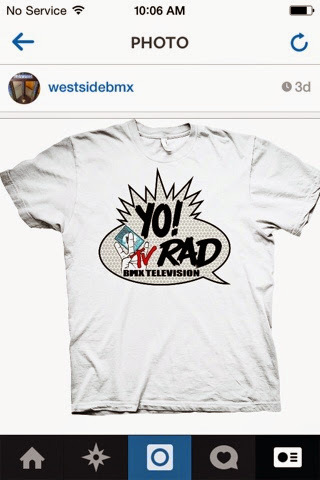 We will also have new limited edition WESTSIDE shirts for $20 so hit us up. 2014 Fourth of july fun. 4th of July 2014 from WestSideBmx TV on Vimeo. I couldnt tell you how many parties our family has been to at the Adams family home.They have become like family to us and its things like this that i seem to look at the fondest as time goes on. Thanks again to them for having us and everyone else.